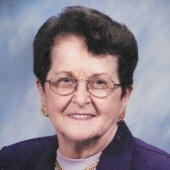 PEORIA - Mary Anna Hutson Finney McNamara, 101, passed away on January 26, 2019 in Peoria. Following cremation, visitation begins at 3:00 pm and her memorial service will be held at 4:00 pm on March 30, 2019 at Faith Missionary Church, 1825 S Airport Rd., Bartonville. Mary Anna was born May 24, 1917, in Eureka, Illinois, to Nathaniel W. Hutson and Nola Pendell Hutson. She married John Earl Finney Senior in 1936 and he preceded her in death. She was also preceded in death by daughter Nola Strickler and son John “Jay” Earl Finney Junior. She was married to Cyril J. “Mac” McNamara and he preceded her in death. Mary Anna is survived by daughter-in-law Mary Lou Finney, grandchildren John (Kristi) Finney, Sheryl Hovey, Rob (Rita) Strickler, Cindy Martin, Karen (Marcos) Gilmore, Debby (Kyle) Pirtle, Rick (Jeannine) Strickler, Angy Strickler and 24 great grandchildren and 17 great great grandchildren. She enjoyed remodeling houses. Her sewing accomplishments included making bears. She was employed as an LPN for many years. In May 1994 during Women’s History Month, she received a Certificate of Lifetime Achievement from the Illinois Department on Aging for her accomplishments. She was a member of Grace Presbyterian Church. Franklin Graham’s Samaritan’s Purse – Hunger Relief Programs https://sampur.se/2FeMhjE. "Email Address" would like to share the life celebration of Mary A. McNamara. Click on the "link" to go to share a favorite memory or leave a condolence message for the family.